Trend Report | De Beers 2013. Diamond Royalty.. Ever since its foundation in 1888, De Beers has been an influential figure in every aspect of jewellery production, from harvesting, to selling. The history of the company is almost as rich as the De Beers bank account, with revenue from 2012 estimated to be approximately $6 billion dollars. 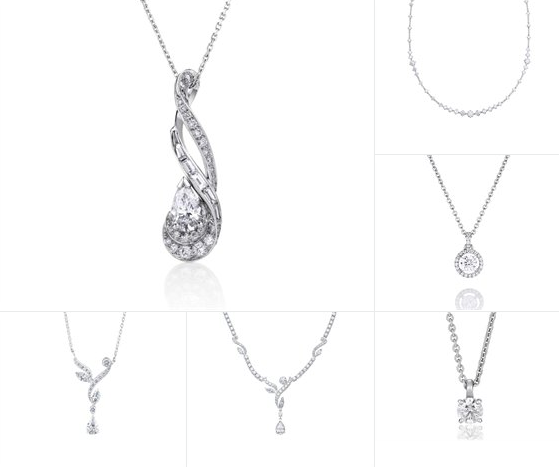 Above are some of the featured necklaces on the De Beers website. My personal favourite is the Aura Pendant (second down, on the right). It is a piece that illustrates all that fine diamonds should, elegance and class, without being too over the top. The most prominent necklace featured above is the Imaginary Nature Pendant, with a total weight of 1.3ct. With over 100 years experience in the production of statement making pieces, it should come as no surprise that the De Beers brand can constantly produce such refined items of jewellery. The Oppenheimer’s have sat at the helm of the De Beers company ever since the founder Cecil Rhodes stepped away from the job. The De Beers company has done a lot to line the pockets of some of the world’s richest men, so give them a chance to impress all your friends by hanging one of these pieces from your neck. Previous: Trend Report | Henry Poole and Co. Swords and all..
Next: Trend Report | Dolce and Gabbana 2014. High-Fashion Handbags..